So, after having heard a lot of good things from a lot of good people about Digital Tutors – and after a short period of lurking around the website, I decided to do the smart thing and jump in with a subscription. The message displayed on screen whenever my subscription was confimred said it all “The best investment you’ll ever make”. I couldn’t be more like a kid in a candystore, there are so many excellent tutorials on pretty much any aspect of 3D / VFX that I could want. I decided that it would make sense to go down a learning path, I figure its kinda like a skills tree from a video game – by the time I’m done on travelling my path, I’ll know a hell of a lot more about whatever the subject is than I did before. With this in mind, I chose a Rigging learning path. I’m really into character development and I want to learn as much as I can about it; from inception to fully realised animation, whether that be in a game or movie. So I started from scratch. I thought it would be best to put aside everything I knew and rebuild my knowledge. The tutorial files gave me a clean piece of geometry ready for boning up and rigging. From there I went from step to step, inserting and parenting joints, creating IK handles, binding the skin to the joints – then onto making sure the geometry deformed the way I wanted it to by using tools like Paint Skin Weights and the Component Editor. When the character began to pose in an effective way, it was time to add some controls. This was something I never knew a lot of before and it wasn’t long into the exercise that I understood the basic of how to make them and how to apply them. The’re just so cool. 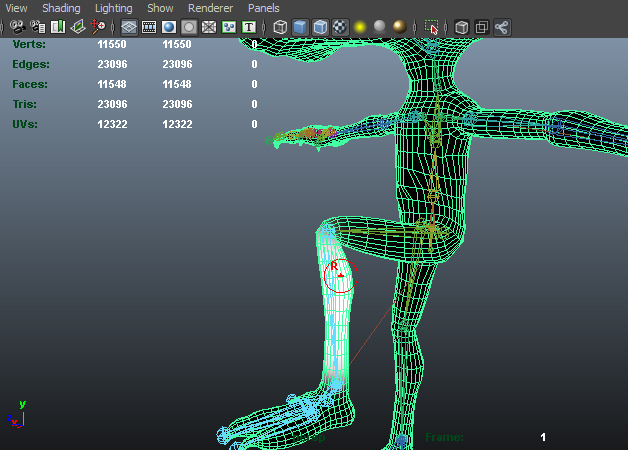 Essentially, they make you a more efficient animator – they consolidate the movement of joints into an easy to grab node. The magic of controls. Tis witchcraft! So far so cool. I haven’t finished the learning path yet but I wanted to post my progress and the direction of my studies. There are 5 parts to this learning path and I’ll be posting my progress and my thoughts as I go. Hey dude! If you can find the, the Animator Friendly Rigging tutorials by Jason Schleifer are uncomparable. Like a knowledge punch to your learning face. Mr Pardoe! Awesome to hear from you 🙂 I’ll check them out – not heard of them before, so thanks. I’m always up for a punch in the face (a learning one).